Karina's Kreations: Stampin it my way card challenge! 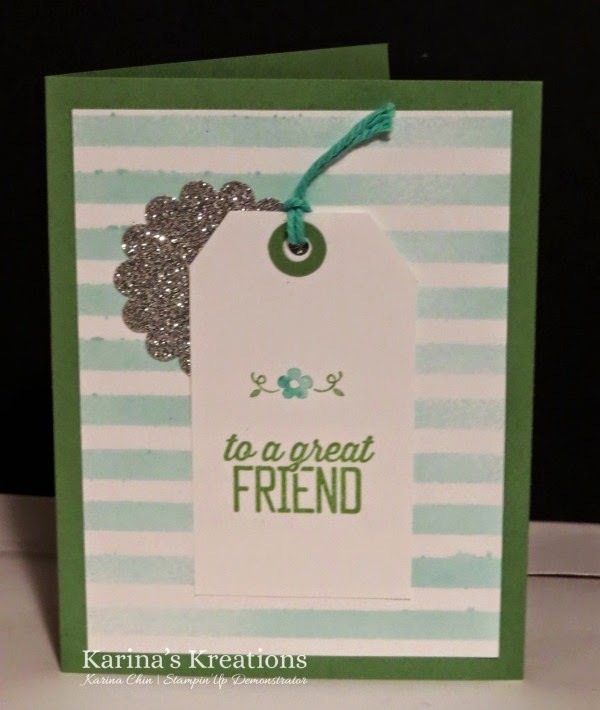 Stampin it my way card challenge! Here's an easy card challenge for you. Make a card with the same pieces I used and post it to my Karinas Kreations facebook page and your name will be entered into a draw. -Wild Wasabi 5-1/2" x 8-1/2"
-Whisper White 3-3/4" x 5"
-Whisper White 2" x 4"
-Any embellishment you want to use. If you don't have the exact colors I used you can still play, just use something similar. I used the Simply Wonderful Sale-a-bration stamp set on my card and the Dots and Strips Decorative Mask with a Stampin' Spritzer. Costal Cabana Stampin Write marker and Baker's Twine was also used.